In the first half of the twentieth century, community musical gatherings were dominated by two art forms: orchestra and choral singing. And of all the choral directors in town at the time, there was one name that shone brightest: Ann Colby Albright. Ann Colby was born in 1899 in Duluth to Charles and Laura Colby. Charles was born a slave in Lewisburg, Virginia. After the Civil War ended—at eleven years old—Charles traveled north to Williamsfield, Ohio, where a white family took him in and gave him his name. He went on to Detroit and then Duluth. Eventually, he became the chef in the sumptuous private dining car of the president of U.S. Steel on the Duluth, Missabe and Iron Range Railroad, serving Elbert Gary (for whom Gary, Indiana, and Duluth’s Gary neighborhood are both named). During his tenure in this employment, he served Robert Todd Lincoln (Abraham Lincoln’s son) and President Calvin Coolidge, both of whom famously raved over his incredible apple pie. Though his job might have required a certain measure of professional subservience, Colby was apparently not given to submissiveness when he wasn’t on the clock. In 1905, a white man named Edward Turner stepped out in front of Mrs. Colby as she walked on the arm of her husband downtown, and said, “Hello, Carrie.” It was an aggressive move to address an unknown woman in a familiar manner, and the use of the name “Carrie” implies that Turner likely did so under the mistaken assumption that Laura Colby was a prostitute and Charles her pimp. Charles Colby punched Turner out, knocking him to the ground, after which the couple continued on their way. She looked back a moment later, and saw Turner drawing a knife. Turner was promptly arrested, and pled not guilty, dubiously claiming he was addressing someone else nearby. The judge didn’t believe Turner, but gave him a suspended sentence. Both the Colbys were active in civic and church activities. Laura, a former schoolteacher, served as the Sunday school superintendent at Duluth’s St. Mark’s African Methodist Episcopal Church and also as the president of the local Colored Women’s Club. The couple concurrently owned two residences, one (still standing) at 825 East Second Street and the other on the property now occupied by Whole Foods Co-op-Hillside. The couple’s only child, Ann was musically inclined at an early age. She asked for and received violin lessons at the age of three, and her parents bought her a piano when she was nine. She graduated from Central High School in 1918 and attended Oberlin College for one year, giving voice and organ lessons on the side. She went on to the Pratt Institute of Art in Brooklyn, New York, where she took only art classes, continuing her study in voice and piano outside school. During that year, her father found out she’d taken a voice lesson that cost $30 an hour. He angrily told her to get a job so she would understand how much money that was. So she did, leaving New York to become a teacher in both mathematics and music, beginning in Clarksville, Tennessee and then Helena, Arkansas at the Southland Institute, where she later said she really learned what “brotherhood in practice” meant. The Southland Institute was a Quaker school for African-American children, and had a fully integrated staff, which was required to live together in one house—an experience that would have been exceedingly rare at the time. After a year in Helena, she returned to Duluth to attend the Duluth State Teachers College, majoring in music. However, graduating from the Duluth State Teachers’ College (today’s University of Minnesota Duluth) did not mean she would be able to obtain a teaching job in her hometown. In fact, though Duluth’s schools were not segregated for students, no teachers of color were allowed to work in the district in any capacity. This made for quite a problem when African-American students approaching graduation needed student teaching experience to complete their program and were only welcome—begrudgingly—in the college’s own laboratory school. In 1929 Ann married Joseph Albright. During the Depression both of them found jobs through the Works Progress Administration. 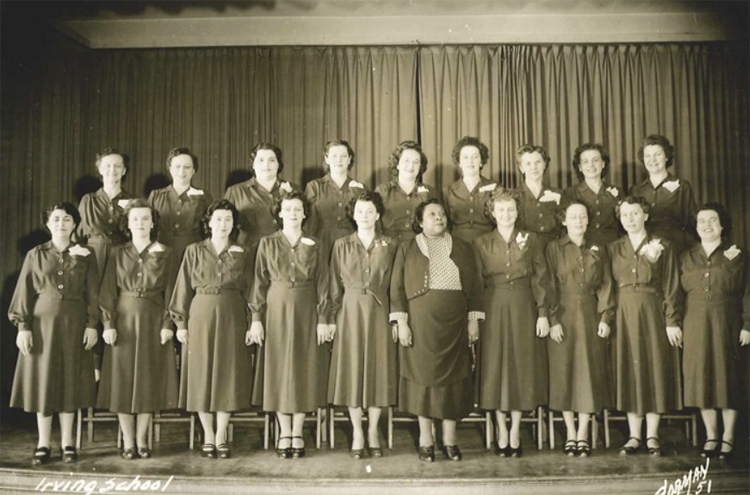 He was a member of the advisory committee of the Arrowhead WPA’s writers’ project and she found her calling when a group of women in Gary asked at the WPA office for a choral director to help them get organized. 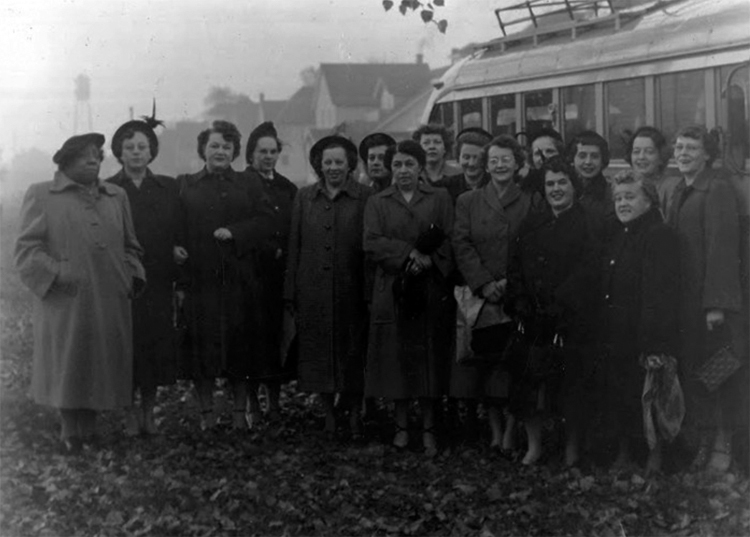 As Mrs. Albright told a Duluth Herald reporter in 1949, “When I got there, I found a group of Croatian women. I said, ‘Do you want to sing in English or Croatian?’ They said, ‘Croatian.’ I said, ‘But I don’t know Croatian.’ They said, ‘Well, you can learn.’” Which she did, developing a huge repertoire of more than fifty Croatian folk melodies. As the Depression ended and World War II began, Albright—then pregnant—separated from her husband. She did not slow down one bit, however, in her musical career. In fact, she flourished. Day by day she has brought to many her love and knowledge of music; day by day too, she has worked quietly, persistently, courageously for the furtherance of understanding among the different races. To each, her profession and her avocation, she brings a personality filled with warmth and enthusiasm, which is the delight of all who work with her. 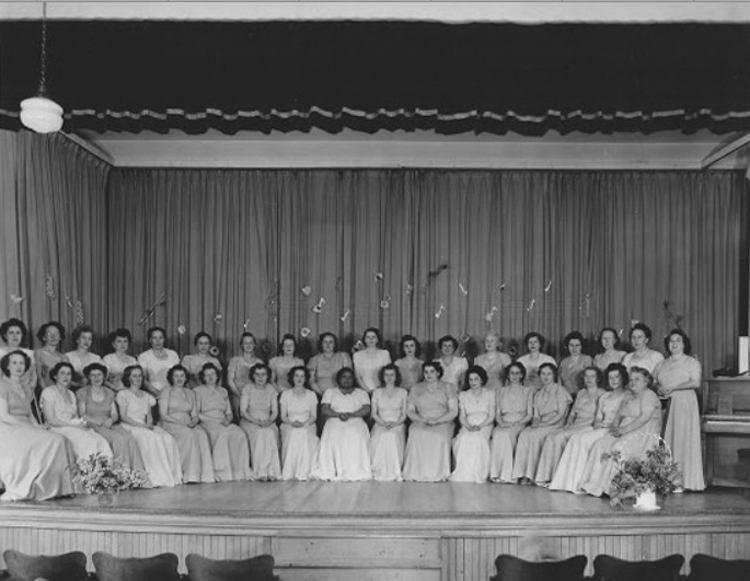 By that time, Albright was leading and teaching myriad groups, including the most active of the Parent-Teacher Association choruses, the Irving School Mothersingers, eventually working to unite this group with other Mothersingers at Munger, Jefferson, Fairmont, Merritt and Grant Schools on various occasions. She also traveled thrice weekly to Clover Valley and Bloomingdale schools in Duluth Township to lead choruses and teach music there. As if this weren’t enough, she also found time to be a member of the education committee of the Duluth Round Table, the National Conference of Christians and Jews, the Y.W.C.A. interracial committee and the NAACP. In 1952, she was nominated for national honors on a radio show paying tribute to outstanding women in the field of better human relations. A scholarship was created in her name to the University of Minnesota Duluth. For eleven years, the Ruralaires, a chorus she led in rural Duluth Township, donated regularly to the fund, as did the North Shore P.T.A. The leader of the Ruralaires, Mrs. Aaron Field, wrote to the University in 1955. “As you know, Ann…did much to break down the barriers between her race and whites, and she did it primarily through music. Ann always contended that music was the only really interracial language. This fund was raised by nickel and dime contributions that came the hard way…from little people.” When the Ruralaires disbanded in 1966, they donated their last $10 to the fund, which had by then been folded into the University Music Scholarship. Today, UMD offers several four-year awards to talented incoming freshman music majors. Undoubtedly, it would do Mrs. Albright proud.